This book is the result of fifteen years research into the hidden history surrounding the historical figure usually referred to as Jesus of Nazareth, and the origins of Christianity. Central to this is the primary role played by the British Isles which the English poet and mystic, William Blake, viewed as the original and archetypal Holy Land on planet earth. William Blake refers to “Jesus the Christ” as the “Shepherd of Albion”, and it would appear that Jesus and other members of the Holy Family visited the sacred land of Britain, the Albionic Holy Grail. The implications are that there has been a monumental historical cover-up surrounding the real Jesus story and the true purpose behind His planetary mission. Because of the vast nature of the ramifications relating to this historical and spiritual mission it has necessitated looking into many facets of human history as pieces of an historical jigsaw puzzle. As the bigger picture emerges (as far as presently possible), an extraordinary vista reveals itself. This viewpoint provides an entirely new perception of recorded human history, for the past two millennia in particular. This revealing and extensively documented book has an important message for these times of transition. The British Isles may have a vital part to play in the evolution of humanity on this planet. The 21st century may herald the Third Age of the Holy Spirit, the Spirit of Truth, when ye shall know the truth and the truth shall set you free. It is hoped that the publication of this book will contribute towards this era of conscious awakening. 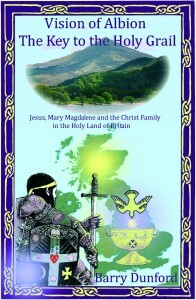 Contents include: The spiritual role of Britain in world history Were Jesus and Mary Magdalene on Iona? Was there a female Apostolic succession? Pontius Pilate and the ancient yew at Fortingall, Rosslyn Chapel and the Rose lineage of Christ. Does Edinburgh contain a geomantic ground plan for the New Jerusalem? The mysterious Mount Heredom and the White Isle of Shambhala. “It really is a master work – a marvellous weaving together of esoteric themes.” – Simon Peter Fuller, England. Author of Rising out of Chaos: The new Heaven and the New Earth. “It certainly is an erudite tome. Congratulations on the successful compilation of your intensive research and the ‘birth’ of your amazing book.” – Margaret Starbird, USA, author of The Woman with the Alabastar Jar and Mary Magdalene, Bride in Exile. “You are to be congratulated in producing such a work which I find so fascinating, well researched and referenced. Your efforts in ultimately producing ‘Vision of Albion’ will have widespread commendation.” – Ian Wright, Scotland. “Congratulations on a superb and extremely well referenced book.” – Edmund Marriage, Golden Age Project, England. “Such a wonderful wealth of detail from so many sources which otherwise I would never have come across. What a fantastic job assembling it all in one book. I shall always treasure this book and keep it handy.” – Jo Fox, Isle of Skye, Scotland. “I have just finished your book ‘Vision of Albion‘, and I have to read it again, and again. Thank you so much for writing it, I’ve learned a great deal from it, and thoroughly enjoyed the process”. – Eileen Tyman, Scotland. The English visionary poet and mystic, William Blake, believed that Albion, the most ancient name for the British Isles, was the original and true Holy Land of Christ. Barry Dunford’s revealing and extensively documented book suggests there may be some substance to such an intriguing notion. Drawing on a wealth of reference source material the author proceeds to investigate Blake’s mystical vision of Albion as the Holy Land of Christ, which is inextricably linked with the English poet’s intuitive feeling expressed in his famous lines “And did those feet in ancient time, walk upon England’s mountains green? And was the Holy Lamb of God, on England’s pleasant pastures seen?” As a result of deciphering clues from gaelic placenames, together with well established traditions and legends, Dunford’s research supports the Blakean thesis of Christ’s presence in the British Isles. More than this, Dunford shows that other members of the Holy Family, including Mary, the Mother of Jesus, Mary Magdalene and Joseph of Arimathea, may have visited the British Isles. If this was the case, then what might have been the reason for their coming from the Middle East, as far as the Blessed Isles of the West? What Dunford’s research shows is that the Holy Family were very likely related to the contemporary royal lineages of Britain, in particular the Silurian royal household whose kingdom, at that time, appears to have stretched from present day south Wales to as far north as the south west of Scotland. Furthermore, there may have been a common gaelic ancestry between the old British royalty and the Jesus family from Galilee in the Middle East. Dunford further records that the entire cycle of legends which has the Holy Grail for its centre is concerned with Britain and Britain alone, and he asks: “Could it be that Great Britain is the holy grail of future spiritual revelation?” He also quotes sources which identify the Holy Grail corpus with the tradition of the hidden Shambhala. Incredibly, perhaps, Dunford’s investigations suggest that the famed Shambhala, the abode of spiritual master beings said to be overseeing the evolution of the human race, is not located in the region of the Asian Himalayas, as is traditionally believed, but rather is located within the sacred Isles of Britain, William Blake’s Holy Land of the West. As far fetched as this may seem, Barry Dunford’s well researched overview tends to reinforce such a contention as a distinct possibility. Interestingly, a Scottish journalist, Comyns Beaumont, has remarked: “The ancient island of Britain is the key to world history in the past and she will be in the future”.